I was a little hesitant to post a chili recipe. Chili, it seems, can be rather personal to some people. Some believe in chili with all beef and no beans, others prefer vegetarian. There are those who pride themselves in their 30-item list of spices and other “secret ingredients”, others are content to pop open a can of Hormel and call it a day. Personally, I haven’t yet committed to any one way to enjoy chili. I’m still open to trying new recipes and discovering new approaches that I like. 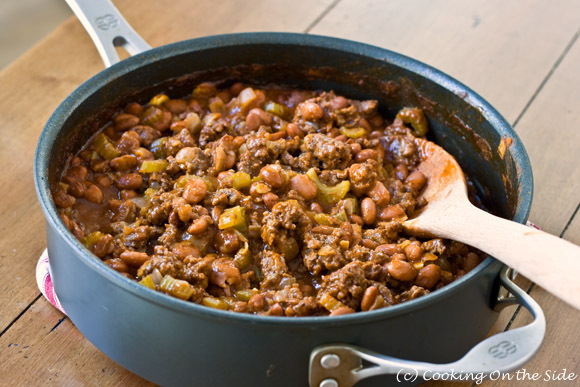 Since January is a popular time to simmer a pot of chili, with the colder weather and football championships and all, I thought I’d go ahead and share an “on-the-side” recipe. Everyone in my house thoroughly enjoyed this chili. There was a good amount of heat without it being overly spicy (no lip burning here), a hint of sweetness from the ketchup and – best of all – it came together in under an hour. Have you heard of “chili beans”? Neither had I. It turns out they’re prepared pinto beans in a tomato-based sauce, several brands make them. Normally I’d prefer to start with the “raw materials” (i.e., dried kidney beans) but, to be honest, the chili recipe on the can of Bush’s chili beans just sounded like it would be tastier than the recipes I found on the dried bean packages. 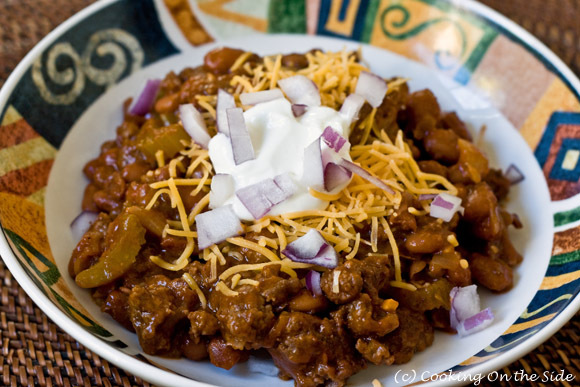 If you haven’t already settled on a tried-and-true favorite, I’d highly recommend giving this chili recipe a try! In a large non-stick skillet, cook beef until lightly browned. Push to one side of pan. Add onion, garlic and celery. Cook until soft. Drain excess fat. Mix in remaining ingredients. Mix well, simmer 30 to 45 minutes. Add salt and pepper to taste. * Look for cans that say “chili beans” – several brands, including Bush’s, makes them. Don’t substitute regular kidney beans, as you’ll omit some of the liquid and flavor needed in the recipe. I love the Bush Chili beans. I use them all the time when making chili. Like you I don’t use “one” recipe for chili. I’m someone who’s willing to keep trying new! .-= HoneyB´s last blog ..Celebrating the 2 year mark with a giveaway! =-. This looks sooo good. I am always looking for a new chili recipe! Your site is great and the photos are beautiful! That honey bread…omg, can’t wait to make that! .-= shelly (cookies and cups)´s last blog ..Frenemies and Granola Bars =-. You are so correct about chili being a personal thing. I am playing tennis tomorrow in below 32 degree weather. So I am making chili very similiar to this recipe to take for all of us that are braving the cold! Nice site! I am allergic to tomatoes (peel, seeds, and pulp) and can’t enjoy conventional chili. This looks like a recipe I could enjoy! THANK YOU!!!!!!!! Beans, beans, GREAT for your heart! .-= Nate @ House of Annie´s last blog ..Buah Tarap – Borneo’s Unique Tropical Fruit =-. Awesome – I know you’ll like it. Can’t wait to hear how it comes out! My family and I enjoy the bush’s chili beans recipe. However, I have been looking for a recipe that will taste similar that I can make from scratch. Does anyone know of a recipe that tastes like this in the end? Thanks. chili recipe used last night.